M T D F e b r u a r y 2 0 1 9 46 O T R T i r e s E very year, the Tire Industry Asso- ciation (TIA) hosts a tire manufac- turers' panel discussion at the TIA OTR Tire Conference. In prepa- ration for this year's upcoming event in Tampa, Fla., Modern Tire Dealer asked the participants on last year's annual panel discussion one question: How do you think the U.S. replacement OTR tire market will fare in 2019 and why? One manufacturer said he already has faced many challengers this year, but "all were positive." Shawn Rasey, director of global earthmover business development for Continental Tire the Americas LLC , said there was a lot of unit growth in 2018. "OE market demand continued to dramatically expand year over year, particularly in sizes for larger equipment which was consistent with OE equipment orders. The replacement market grew again in 2018 for the U.S. and Canada by a more modest level." Rasey, who also will be a panelist at this year's conference, said future replacement demand "should be buoyed by the larger volume of new OE machines going into the market in 2017 and 2018." Here's what each of the other panelists from last year had to say about the domestic OTR tire market in 2019. Gary Pompo, regional sales manager, BKT USA Inc.: We feel that 2019 will be another good year -- as long as Washington gets it together. If the federal government doesn't get the shutdown resolved it will hurt the national projects that are going and scheduled to start. But the economy is strong — everywhere you go there is construction, expansion going on. With that said, equipment orders are up, rentals are booked, so it's great for us here at BKT. Jimmy McDonnell, vice president of sales and marketing, Maxam Tire North America Inc.: We expect the U.S. Replacement OTR Market to grow at a moderate pace in 2019, somewhere in the neighborhood of 3%. We are expecting good growth in OEM sales as construc- tion and mining segments continue the positive performance and companies are investing in new equipment. Of course there are still many question marks about the general state of business in the U.S. (e.g., trade war with China, the instability of the stock markets). If the U.S. government can continue and increase spending in infrastructure we think the results could be significantly stronger. Bruce Besancon, vice president of off the road Sales, Yokohama Tire Corp.: e U.S. replacement OTR market should be on an excellent path for 2019 with moderate growth. ere is growth seen in construction markets — obviously highly geographic, but Texas/western U.S. and southeast U.S. are showing significant gains year-over-year — and given the "relatively" calm winter thus far… we have actually seen several areas that have been able to work more in the November-December time frame than they had in previous years. The industrial tire sector — ports, terminals, rail yards, heavy manufactur- ing — continues to grow. It is estimated that port traffic in many areas in growing at 5% per year. Steel mills are putting out more product than in previous years and continue to give upward forecast. Our rail yards, somewhat forgotten in the not too distant past, are seeing new signs of life as more and more "in-land ports" are springing up across the country to off-set the space requirements of the on- water ports… our rail system is still one of the most economically viable sources of transportation from coast to coast. Sand and gravel operations are showing upward trends as demand for road work and building supplies/concrete spur this along. And mining, both underground and surface, are "making hay while the sun shines" under the current administration, which appears to be more favorable to this business. While we are not seeing any significant "greenfield" mines, we are seeing increased tire demands from many of the mines that had been slowed in past years, with the most significant increases in eastern coal. Rob Seibert, executive director, sales, off-the-road tires, Bridgestone Americas Tire Operations LLC (BATO): 2018 ended on a positive note and we anticipate the OTR replacement tire segment overall to remain healthy in 2019. We are particu- larly optimistic about the construction and aggregates segments. Infrastructure demand continues to grow and many construction companies are operating at capacity, creating pressure to maximize uptime and increase the amount of earth moved each day. 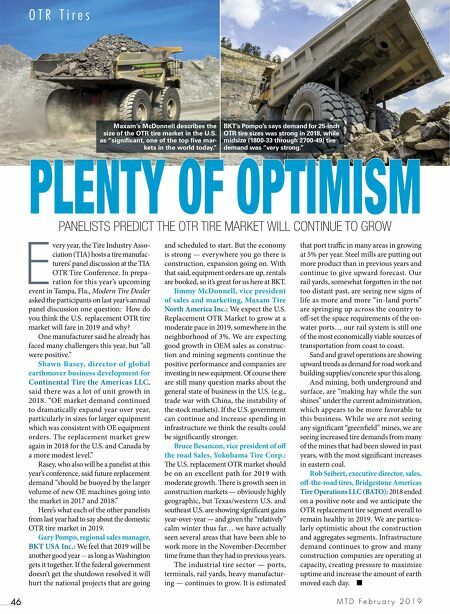 ■ PLENTY OF OPTIMISM PANELISTS PREDICT THE OTR TIRE MARKET WILL CONTINUE TO GROW BKT's Pompo's says demand for 25-inch OTR tire sizes was strong in 2018, while midsize (1800-33 through 2700-49) tire demand was "very strong." Maxam's McDonnell describes the size of the OTR tire market in the U.S. as "significant, one of the top five mar- kets in the world today."